Visit www.umakemehungry.com for more reviews. Getting bored with many western food from the hipster cafes nowadays? Be glad when you visit No. 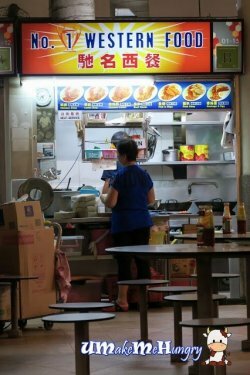 1 Western Food in Tanglin Halt as they still have the traditional kind of Western Food to make you feel nostalgic. Chicken Cutlet was served uniquely in a metal plate which I dont remember having such presentation from any other Western Food Stall. The slab of chicken cutlet was deep fried to golden brown perfection with crispy texture on its exterior by the breadcrumbs. As we bite that down, the meat was very tender and extremely juicy without retaining any excessive grease. Beside the presentation, it was all in the sauce that make this Western Food No.1. Ingredients of the sauce was a trade secret, home made by themselves. It tasted tangy filled of tomatoes with a good mix of BBQ Sauce, slightly on a sweet side but a great compliment to all items on plate including the ubiquitous baked beans, sliced cucumbers, tomatoes and frozen cut fries. 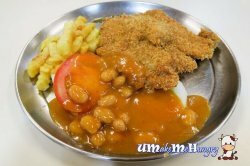 Chicken Chop on the other hand was served on a usual blue plate with similar sides. The special Sauce used here were the same and the only difference was that the chicken was served grilled. For all that taste was pretty standard, there were no slightest taste of frozen meat which I got from other Western Food Stall. Likewise, the meat was fork tender without being too greasy. Having seen lesser and lesser of such Western Food Stall around, I began to appreciate such traditional food that come close to heart. They may not have the fanciful presentation like what we had in cafe nowadays but deep down I know such food are still greatly missed once in a while.